WAM! 4 Kids 4 the Way : Kathie Hill Music, LLC, Making music with and for kids for over 25 years! This is the bomb! My church incorporated songs and activities from WAM! to add energy to our traditional children's choir program. It has provided ways to meet the expressive needs of just about all of our children--even the ones who are too "cool" to stand and sing in a choir setting. "CHRISTIAN" with its associated movements has become one of my choir's on-going favorite fun activiities. WAM! 4 Kids for the Way has been a fabulous addition to our program. Our church was transitioning from a traditional children’s choir to a worship arts style ministry and took a chance on WAM! 4 for Kids 4 Christmas. Our kids loved the music, the director and workers appreciated the activities and we all enjoyed the drama. It was a perfect tool to move us from “sit and sing” to "up and active" rehearsals. I highly recommend it. WAM! 4 Kids 4 the Way is the 3rd release of Worship Arts and Music resources from Kathie Hill Music which features seven songs to present separately or collectively in a concert, camp or Worship Arts Celebration. WAM! 4 Kids 4 the Way songs follow the evangelism verses in Romans to teach “the way” to salvation and includes a “5 K 4 the Way” script included on the Listening CD and with the Vocal Charts (other script options are included in the Drama Activities). Arrangements run the musical gamut from worship choruses, bluegrass, rap, big band and ballads. So whether you present these songs with a script or separately, kids and tweens will find the music and worship arts activities to be “way” cool! WAM! 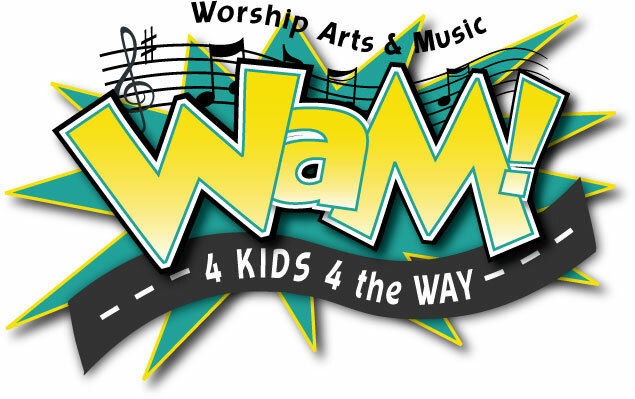 4 Kids 4 the Way offers a choice of ART, DANCE, DRAMA, INSTRUMENTS, MEDIA, & VOCAL activities which correspond to the songs, plus Rehearsal Guides for the large group MUSIC WAM! Sessions. These activities, grouped both by song and by worship art, are guaranteed to attract more kids to your kid’s music program or camp. (For more info download the WAM! 4 Kids Tutorial or WAM! 4 Kids Camp Tutorial.) Note: The Demonstration Video (WMV) features a full performance of all 7 songs with Drama Opt. 1 and demonstration of most activities. Save money by purchasing a license to download all seven songs here or click Single Songs > WAM! Single Songs > WAM! 4 Kids 4 the Way under Product Categories (to the left) to purchase the individual song resources. With each paid license you can make the number of copies (1x, 3x or 5x) listed for that product. NOTE: Downloads are available upon process of your payment and some will require a broadband connection. NOTE: The downloads on some of the music files are pretty hefty -- a broadband connection is recommend. Simple narrations to the 7 WAM! 4 the Way songs as featured on the Listening CD. Simple multi-character drama script to the 7 WAM! 4 the Way songs - can be read or memorized.